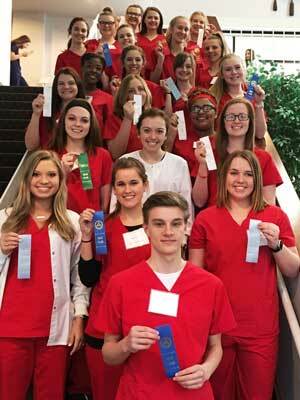 NAHS students participate in HOSA District Competition. The student organization HOSA-Future Health Professionals recently held the district leadership competition at Delta State University in Cleveland, MS. April Voyles is the Health Science instructor and also serves as the HOSA advisor. The New Albany Career and Technical Center at New Albany High School had twenty-four students to participate in the competition. Twenty-one of the twenty-four students are eligible to compete at the HOSA state leadership competition in Jackson, MS in March. Hailey Adsit, Alex Criswell, Sydney Collier, and Payton Robbins are eligible to compete at state competition in Public Service Announcement. Bethany Farrar is eligible to compete at state competition in Dental Science.